VARC has developed and implemented value-added systems across the country. From Los Angeles Unified School District, to the state of Wisconsin, to consortia of smaller districts, we tailor our models to fit the unique policy and technical constraints faced by each of our partners. 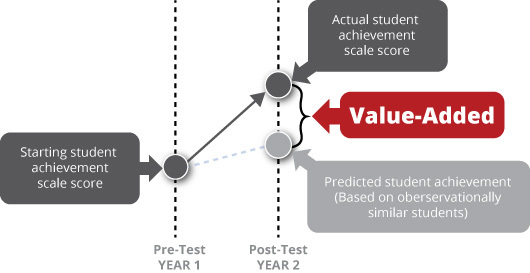 A value-added model looks at a student’s performance on standardized assessments over a period of time. It then compares the change in the student’s scores to those of observationally similar students. If the student grew more than predicted by these peers’ performance, we say her teacher had high value added. That is, the value the educator added to the student’s growth was higher than predicted. We believe value added is a comprehensive measure of educator effectiveness. Rather than looking at a snapshot in time like achievement measures do, value added looks at a student’s growth over time. Value added takes into account factors outside an educator’s control that affect a student’s learning, such as socio economic status and peer effects, in order to isolate the educator’s effect on student learning. Once calculated, student growth estimates can be used in a variety of ways. For more information, please see our Policy and Professional Development pages.